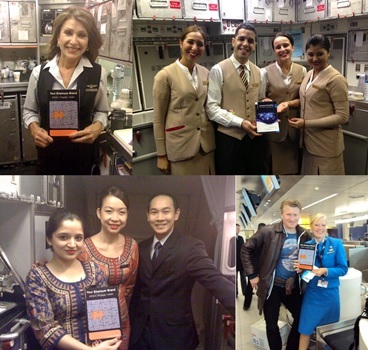 I was fortunate to share many wonderful moments with friends and partners during my 2014 Employer Brand Global Tour, which took me to London, New York, Milan, Vilnius, Toronto, Sydney, Perth, Cluj, Bucharest, Vienna, Stockholm, and Singapore! On the way home (24 hours of flying) I reflected as I always do at this time of the year to think about the year ahead. I’ve now travelled to more than 50 cities in 30 countries on my employer branding global tours since 2007 and each city I visit provides new insights into the challenges and successes companies are experiencing in developing, implementing, and managing their employer brand strategy. The rest of this year will be a break out year for the employer branding industry if the trend of companies hiring dedicated employer brand leaders continues as it has over the past few years. We will see a tipping point in employer branding, led by the U.S. But even in a growth market talent is getting harder to find. Getting your employer brand strategy right will require a dedicated and disciplined approach by the leader driving the strategy with strong support from leaders across all lines of business. It’s been great to observe in 2014 the trend of companies such as Google, Facebook, 3M, UnitedHealth Group, IBM, EY, Repsol and Amtrak engage employer branding talent to manage their strategy and shift their focus of employer branding from an add-on function in an already overworked HR department to a strategic one. Our 2014 Employer Branding Global Research Study report also provided insights into how employer branding has evolved in 18 key regions around the world over the past 5 years. For a complimentary copy of the report, click here. Below is a list of 15 key focus areas which will assist you in your journey. 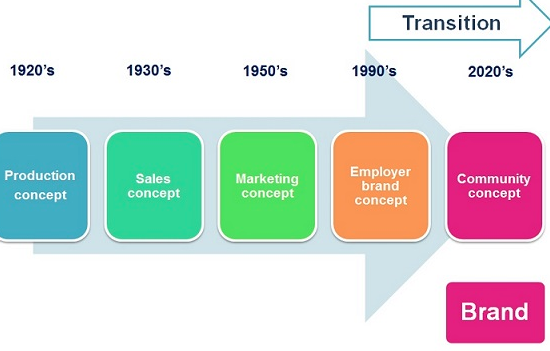 While not all may be achieved in 2015, having an understanding of these trending areas for employer branding will keep you focused in the right direction in a management field which is growing in importance in companies all over the world and one which will continue to challenge the value of traditional functional departments such as HR, marketing, and communications over the next five years. Success in business can no longer rely on out-of-date organizational structures and siloed functional departments. Today’s pace of change requires organisations to adapt their business model to one that is agile and reactive to continuous market changes. These are five questions all leaders need to know the answer to. They are also some great questions for candidates to ask at interview to assess how evolved the company is in their approach to employer branding. 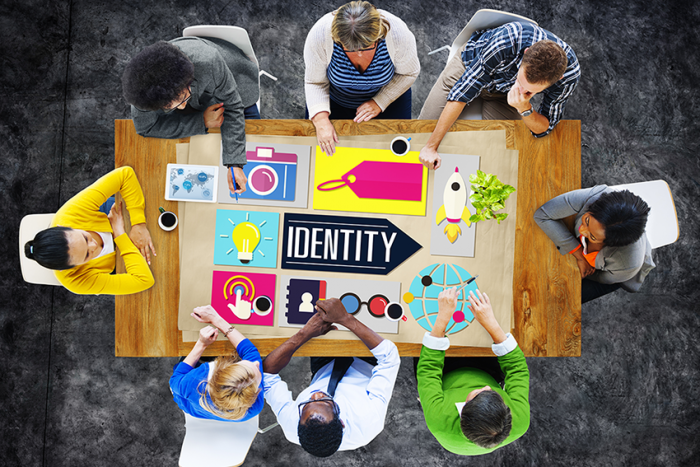 What is the perception employees and candidates have about your employer brand? In 2005 when I was finalising my first book, “Your Employer Brand attract-engage-retain,” I wanted to consolidate my research from the previous three years and develop a strategic framework to assist leaders to develop and manage their employer brand strategy. The Employer Brand Excellence FrameworkTM can be used to guide your employer brand program across the employee lifecycle from pre-hire to retire (see figure below). Successful implementation of the framework will ensure the promise to customers that is articulated by the company’s corporate and consumer brand is matched by the promise delivered to employees by your employer brand. The framework is even more relevant in today’s environment, which requires companies to apply a “systems-thinking” view to how the employer brand impacts on the organization’s ability to attract, engage, and retain talent and the linkage between employees, customers, and profit. Systems thinking is the process of understanding how things influence one another within a whole. In organizations, systems consist of people, structures, and processes that work together to make an organization healthy or unhealthy. Too many companies and vendors still promote employer branding as a talent acquisition and/or recruitment function. Companies adopt this perspective usually due to a lack of awareness of the benefits of employer branding across the employee lifecycle while vendors usually take this approach to support the business development of their products. Focusing employer branding on talent acquisition only usually results in an improved recruitment and onboarding process that has usually very little impact on culture and/or business performance due to lack of consistency in the employee experience as they evolve through their tenure. Siloed organisational structures also do little to promote a strategic approach to employer branding because the HR personnel don’t get along with the marketing and/or communications personnel. Exacerbating the situation further is executives that have very little awareness of employer branding so it ends up as an operational project that lives in the HR department but has very little impact on business performance. A strategic approach to employer branding requires a strategic perspective towards how your company attracts, engages, and retains talent. Undertake an employer brand audit and/or employee experience mapping project and hopefully the results will inspire your leaders to change their perspective and thinking on employer brand strategy and management. Your organization’s mission, vision, and values should be clearly defined and this should flow through to your employer branding communications. Two of the standout companies in this area are Apple and Starbucks. Being present, connecting with transparency, dignity, and respect. Many of the world’s top companies such as P&G, Mars, Chevron, and Google are thinking “community” in their approach to employer branding. They adopt a strategic approach across the employment lifecycle and consider all internal and external stakeholders in developing their strategy through an integrated corporate, consumer, and employer, one brand lens. Their employer branding 3.0 approach is focused on sustainable business practices at a time where corporate sustainability is being challenged by an increased focus on ethical resource allocations across energy, water, and human resources. Advertising no longer has the impact it once did! We are now in the age of the customer. This has placed more responsibility on organizations to clearly define the role of employees in delivering signature employee experiences. If my experience (photos at the top of this article) is anything to go by, those who have flown with Singapore Airlines or Emirates would have experienced a seamless experience from the moment they decided which airline to fly to when they exited the airport at their destination. This doesn’t happen by chance. It is a result of aligning the employer brand strategy at an organizational level so that HR systems, policies, and processes have an impact across all lines of the business and influence company culture focused on optimizing the customer experience on every single flight. The risks of shifting manufacturing and/or production offshore and/or recruiting talent from outside local borders has to be weighed up against the risks of not doing so. Increasingly due to the threat of terrorism, quality concerns, and corporate agility, companies are reconsidering their appetite for political risks especially in industries such as construction and oil and gas. Outside of the U.S., Australia, New Zealand, the UK, and the Nordics, research by Maplecroft show medium to extreme levels of political risk in most other countries. One way companies will react to this risk is by engaging talent from these regions on a project-by-project basis as they become visible through their participation on professional networks such as LinkedIn and Facebook or other popular local networks. The global economic forecast for 2020 is not as bad as one might think. Whilst a decline of 5 percent is predicated in emerging markets, growth of 3.5 percent is expected in Eastern Europe, 2.3 percent in Eurasia, 5.6 percent in Asean, 3 percent in Latin America, and 4.2 percent in Middle East and North Africa. There will also be opportunities for growth for companies who are able to localise their employer brand strategy in their key growth markets. It’s time to resolve the ownership debate. 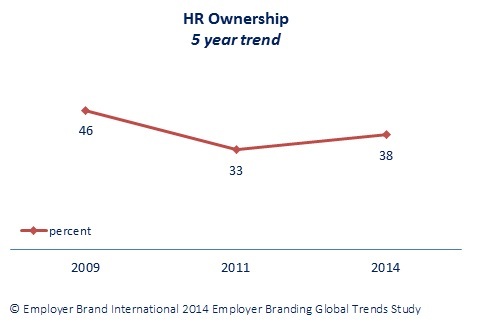 Research by Employer Brand International shows a shift in employer brand strategy ownership away from HR over the past five years. Whether the personnel responsible for the employer brand strategy come from human resources, marketing, communications, or another function is not the debate we should be having. The focus should be on how your company develops a competent team of professionals sourced from inside and outside the firm who can develop and execute an employer brand strategy that builds value. The traditional siloed approach to managing the attraction, engagement, and retention of talent is out of date and out of step with today’s candidate and employee needs. More needs to be done by organisations to facilitate cross functional leadership of the employer branding function to ensure a more cohesive approach. In more than 100 events I have presented at I can only recall one finance director in the audience (from Nike! ).There is little wonder why one of the biggest challenges for employer branding leaders is to gain budget approval for their employer brand strategy. The focus for the employer brand leader is on recruitment at companies such as Facebook, Amazon, and KPMG. However companies such as LinkedIn, IKEA and Amtrak have adopted a holistic approach to employer branding across the total employment lifecycle. History shows that companies transition toward a strategic approach to employer brand management after two to three years of adopting the concept. This is consistent with how employer branding evolves inside a company as expertise and experience builds across the leadership teams. With the increasing talent shortages around the world we will begin to see many more follow the lead of companies such as Google, IBM, Marriott, 3M, and EY with recruiting leaders seeing the value an employer brand strategy has on profitability and sustainability. While there are company culture and structural issues in reorganizing and implementing a holistic employer branding function, if the trend of appointing employer brand managers continues as it is has in the U.S., Europe, and the UK over the past few years, there is no doubt the role of the employer brand leader will become more commonplace in places such as Russia, Brazil, UAE, Poland, and Asia as companies in these regions seek the benefits gained by those companies who are already three to five years into their journey. Companies such as Orange have innovated in the use of mobile technologies and have adopted a one platform for content and services to be broadcast on multiscreen, multichannel, and multilingual (one multilingual cms + delegation can be given to countries). There are two types of data: 1) data that is technical in nature but complex and challenging to understand what it is telling us, and 2) data that is easy to understand and provides for solutions that will impact on corporate performance. Platforms such as LinkedIn now offer the ability to mine data to show the number of talents in a segment (e.g. IT engineers in the USA) based on the number of job listings in each city. Analysing the data further allows you to better target your employer branding communications to ensure you reach the talent you are trying to hire. Don’t fish where everyone else is fishing! Find where the hidden gems of talent are and engage with those. As talent from emerging markets join online professional networks it will create challenges and well as opportunities as companies are forced to expand their market reach beyond their own borders and tap into the on-demand workforce. This is experiencing significant growth as barriers to entry decrease in industries such as taxis, home help, and fast food. Even in the employer brand industry, new business models are launching which reduces the time to audit and develop an employer brand strategy in half simply by using smart technologies to collect internal and external insights compared to the traditional cumbersome face-face focus groups and leadership interviews. Not only is time saved but the cost is also reduced. Research by PwC and LinkedIn assessed countries’ talent adaptability, which is the rate at which people switch between roles and sectors, the rate at which they’re promoted, and the number of jobs left open in a market. The research found visibility from online professional networks leads to better hiring. Online professional networks give organisations access to a larger talent pool, and critically, to passive candidates as well as those actively looking for a job. Similarly, talented people can explore well beyond their own borders and have access to far more information on potential employers. For the cost of under $500 for a tablet or smartphone companies can put self-learning at the fingertips of employees and train them on how to get the information to come to them. People are already questioning the value of university education at a time when course fees are increasing at a rate well above inflation and a degree no longer guarantees a job, especially in service functions such as HR, marketing, and communications. There are an increasing number of open-source free education websites available to anyone with an Internet connection. An open-source curriculum (OSC) is an online instructional resource that can be freely used, distributed, and modified. OSC is based on the open-source practice of creating products or software that opens up access to source materials or codes. Applied to education, this process invites feedback and participation from developers, educators, government officials, students, and parents and empowers them to exchange ideas, improve best practices, and create world-class curricula. These “development” communities can form ad-hoc, within the same subject area or around a common student need, and allow for a variety of editing and workflow structures. One such OSC is MIT OpenCourseWare (MIT OCW) which is an initiative of the Massachusetts Institute of Technology to put all of the educational materials from its undergraduate- and graduate-level courses online, partly free and openly available to anyone, anywhere. Over the past few years I have found from personal experience that 1,000 connections each across LinkedIn, Twitter, and Facebook is a significant number to build value with. However with the speed at which these platforms grow and mature, that number should be pushing to 2,000 across each of the platforms in 2015. The key is to continuously organically grow your network. Ensure you have global reach on your network and it is diverse enough to ensure you are learning and connecting with people from a range of talent from different backgrounds. I encourage students in our Certificate in Employer Brand Leadership course to connect with at least 50 other employer brand leaders and also other interesting people outside this group such as HR, marketing, and communication professionals, agency heads, and industry thought leaders. There are a range of tools such as IBM’s social software solutions to support the communication flow inside and outside your organisation. These tools assist organisations of all sizes to work smarter, become more agile, and foster innovation. Soxedo USA has been innovators in the use of social tools to enhance employer branding communications internally. Having a successful social media program that is highly visible has led to a high degree of cooperation between the talent acquisition team and other divisions. Other sections of Human Resources, as well as Marketing, Sales, Diversity, and Corporate Communications, now use the Sodexo social media presence to better launch initiatives and connect with clients. Sodexo’s mobile initiative aims to help them meet the company’s ambitious growth goals by expanding their reach and engagement with candidates — both internally and externally — by providing on-the-go access to all of their online properties where they can interact with recruiters on the social network of their choice. Even better, they can search and apply for jobs directly from their mobile device regardless of immediate access to a desktop computer. Employees can also make referrals directly from the mobile app anytime, anywhere. Managing the employee experience across the employment lifecycle should be a shared responsibility. Employer brand leaders need to build awareness and capability in employer branding principles and practices across the organization rather than relying on only one or two leaders to manage the function as has been traditional practice. How do we measure the return on investment of employer branding? How will market trends impact on how we attract, engage, and retain talent over the next five years! Ten years ago employer branding was a nice to have. It has now become a strategic imperative and while we see companies such as Google, Amtrak, UnitedHealth Group, LinkedIn, Marriott, Ferrero, IKEA, and Nike adopt a strategic approach to employer branding, the majority of companies are still focused on using employer branding for recruitment. This only leads to an employee experience that is inconsistent, disjointed, and far from what was promised on their way in to your organization. Employees deserve better! Brett Minchington MBA, chairman/CEO of Employer Brand International, is a global authority, author, and corporate advisor on employer branding. His global footprint includes delivering employer branding events and training in more than 50 cities in 30 to thousands of senior leaders from a majority of Global 500 companies. He is the world’s most published author in employer branding and has featured in major newspapers, HR, management, and marketing publications around the world. He has consulted to firms on global and national employer brand strategic projects and his latest book Employer branding and the new world@work is the latest thinking on employer branding. It’s a must read for leaders responsible for the attraction, engagement, and retention of talent. Information about his books and articles on employer branding can be found online.